Now, in my experience as a GM, the players always do the unexpected BUT they manage to make whatever rolls they have to do to accomplish them. Which just leaves me in tears (usually the good kind) as the party saunters past whatever I had planned. But such is life. That wizard must have been higher than level 2 - otherwise they'd have had a body, not a prisoner. Ahh... d4 HD. Those were the days. It was comical. The rogue, at least should have easily made the Dexterity check. AS it is, the rogue is starting to become the party wizard (is now an Arcane Trickster and wields a magic staff) The sorcerer is becoming more of a tank (2nd highest in AC and hps in the party) and the fighter seems to be some sort of scholar since he's ALWAYS rolling really high on knowledge checks! I'll certainly give your players credit for playing outside the normal roles. The little guy is totally ingratiating himself to the party. THoguh outside of knowing the layout of this specific dungeon, he's going to be pretty much useless to them. Wizard... with 5d8.... I... I think I need to sit with my 2E books for a while. D8s... That's just crazy talk, there! I may be wrong, but I think that every NPC in 5th Edition has d8s for hit points. And I have yet to see an out of the box NPC who has character class levels. The previously-mentioned party cleric has really taken a shine to him. Even talking about hiring him on to be a henchman. I intended to simply use him as a way to foreshadow events going on further east that will comprise the next module. But maybe I can do something with him. Not as a villain, but as a convert for the cleric. Yeah, NPCs don't really get class levels as sop anymore. 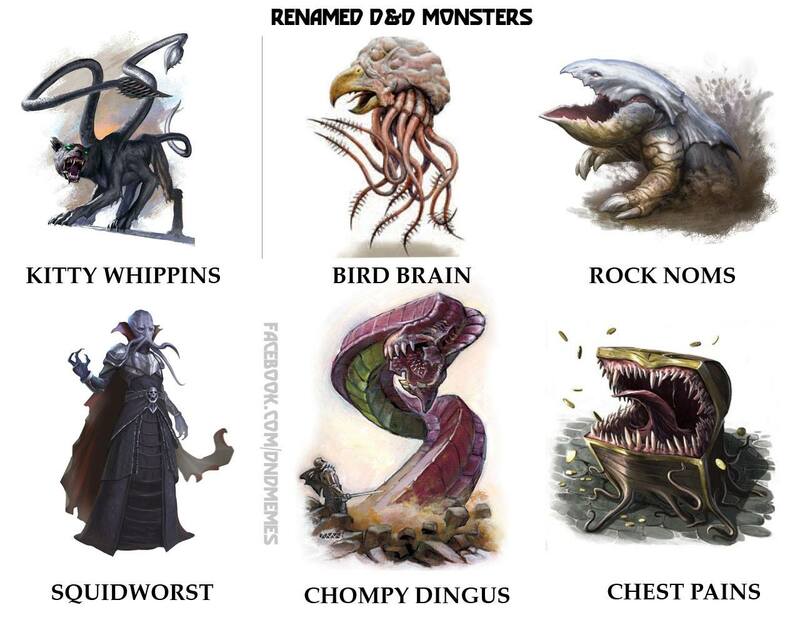 Less of a headache for DMs. But it also means players and monsters effectively play by two different sets of rules. One of my groups had a goblin tag along with us for a while. And then, when someone had to die to open a puzzle, he sacrificed himself for the party. And one of us is still carrying around his pickaxe. That is awesome. Just... don't reveal it to the cleric just how *successful* he was at converting the little blighter - until the Proverbial hits the Mover-of-Air, and ye Olde Henchman lays out a Smite. Then give the cleric's player the character sheet for his Most Trusted Follower... (and cue the not-so-evil snickering when you do that). Yea, I've heard that. Haven't played 5th yet, so don't have any practical experience with it. Looking at the PHB, it looks like they did pull inspiration form 1E/2E, some from 3/3.5/Pathfinder, and ditched a lot of the "This is really a computer game programming manual" aspects of 4E (*spit* - eh, excuse me). But that's just from reading, one of the core books, not anything practical. Would y'all mind if I share some of my own stories? I'd have to put some thought to mine - both in remembering (heh) and generalizing in the sense of removing in-jokes or giving pages of explanation to why "That halfling is as shady as f***...."
In an old, and short-lived Ravenloft campaign (and no, not short lived because Ravenloft, actually), I had a cleric... I want to say of Fharlanghn, but now that doesn't sound right... that was a bigger thief than the party thief. Embezzlement for the win! So this isn’t technically a D&D story, but it is still pen and paper, I hope that's fine. I’m going to do my best to summarize an entire (admittedly short) campaign in one post, so this might be a little long but I’ll try to keep it as short as possible. This was the first game I ever game-mastered and it was a little… unusual and very ramshackle at times. It was just me and one player, mostly because the rest of our group was busy at the time and we really wanted to play something, anything. The game itself was Vampire: the Dark Ages, I think; whatever it was it was heavily modified and barely recognizable. The setting was basically feudal Japan (mostly because I'd just finished watching the Extra History series on the Sengoku Jidai), minus the samurai being the absolute law of the land. My dear player decided to play as a land-owning samurai, which led to the game being more of a conquest game, with some roleplaying here and there, and a little bit of intrigue thrown in on top of that. I wanted to establish that this game was going to involve intrigue and would be about shaking the current order of things; I did this by assassinating the divinely ordained emperor (he was poisoned so there was uncertainty about whether his death was illness or not) and leaving his prepubescent son as the only legal heir. Conveniently my dear player had established that his family had a dynastic feud going with one of the other major noble houses, so I decided that the empress turned queen-mother was a member of the rival house. Now I wasn’t going to be a jerk and bring the hammer down on him straight out of the gate, that would be in bad taste in-universe as his family hadn’t technically done anything illegal yet. But he was still hesitant (rightfully so) when he was invited to the capital for the coronation of the new child emperor, but being that it was his duty to do so as a vassal, he still went. So Mr. Samurai Lord arrives at the capital and being that he has the poetry skill, he composes a funeral poem (I’m sure there’s a better term for that) and he reads it in front of the mourning court. And rolls almost perfectly leading to several members of the court (including the normally stoic empress) to break down crying. Though I didn’t know it at the time, this would be how he rolled for the entire game, at least when it would do maximum damage to my preparation. So after the previous emperor is buried and the new emperor crowned, the nobles gather to sort something out; who gets to be the child-emperor’s regent? The solution, someone suggested, would be to have the assembled nobles vote on it. Now, I had planned for this to be a sort of show of force for the rival house, the patriarch of whom was basically a guaranteed winner being that he was a respected statesman, successful military leader and the maternal grandfather of the child emperor. But my dear player stepped in and said, “I’m going to try to sway the vote in my house’s favor!” So he made some rolls… and nailed it. His house’s patriarch was named regent and that set in motion events that would lead to a civil war that would destroy the power base of the bureaucratic nobility that had kept the realm together for centuries, leaving the samurai as the dominant power of land, establishing a Shogun that was more powerful than the emperor and leaving the nation peaceful for a couple centuries until, Sengoku style, the samurai started fighting over the position of Shogun. But that was a later game that never came to be. There was a surprising amount that happened in the five or six sessions we played (turns out players can get a lot done when it's all one person making the decisions), including several assassination attempts, successful assassinations, making deals with criminals, general treachery, adultery, kangaroo courts, and beheading rivals. And while it was fun, I have long since lost my notes (which is why I didn’t use any proper nouns, I just don’t remember them) so a good chunk of the specifics are lost to time. Sounds like you were really able to think on your feet there! So ran with my group again last night. In the end, they decided NOT to keep the goblin with them. Surprisingly, because they were worried that he'd get hurt traveling with them. Their current patron has agreed to "find something for him to do" So I'll have to come up with stuff he'll be doing while "off-screen". Maybe have him hang out at the Shrine of Tymora in town. Still, from pretty good guesswork, they actually came within a couple of miles of the final dungeon of the campaign. As it is, they kept on wandering and ended up meeting a cave full of orcs. There was a bounty for clearing out that den anyway, but I think the ogre with them came as a surprise. Not sure who's captured here - the goblins with captives were, themselves, captured? Or the Party? One of the things I warn players of when I DM is I very, very rarely scale. If it's an Ancient Red Dragon, it's an Ancient Red Dragon, even if they're barely level 2. Running away can be a very good tactic, when appropriate. I had thought about that. But he really is incompetent at combat. I think giving him a martial class like that would be strange. There is a subclass of warlock where you can make a pact with a good-aligned celestial being. Perhaps with one of Tymora's agents? He'd be more of a caster then. There are three dwarf brothers. One they know has been kidnapped and taken to the local goblin king. The party is looking for the other two brothers, who have also been captured (though the party does not know this yet) and one of the brothers has since died in captivity. There are actually several encounters like that in the next module I'll be running. It was a CR5 encounter, and they were level 3. Let's just say it was a good thing they went into this fight fresh. You know your NPCs better than I, LOL. I like messing with the party along the "but everyone knows that!" lines. There's an old Birthright module that subverts the "if it has stats, it can be killed" trope - the players have to infiltrate a Big Bad's (minor) fortress (he has several) to rescue a prisoner. The Big Bad happens to be in residence, and the party will meet him. The module explicitly does not stat the Big Bad (technically, though, he's statted in the Campaign Setting books), and the DM is bluntly told "he has any weapon proficiency and mastery needed". It goes on to say that the Big Bad is sick of the "prisoner" (and their incessant prattle), so if they would kindly take it and GTFO, they won't die. If they try to initiate combat (heh... try...) kill a player. If they retreat, let them go, otherwise keep killing the players until they retreat or only one remains and is down to ~5 HP, then the Big Bad takes them and the "prisoner" and dumps them at the gates, telling the remaining one to "just effing GO already." LOL. Hate it when that happens!